Located on De La Cruz Blvd., Extra Space Storage is accessible for residents of Santa Clara, Sunnyvale, and San Jose. Locals will recognize our facility across the street from Costco. We're also conveniently located for residents of nearby apartments, such as Main Street Apartments, Civic Plaza Apartments, Greenpointe Apartment Homes, Belovida Santa Clara, and Solera Apartment Community. Very accessible, clean and very helpful people. Location was right for me. A bit pricey but it's the bay area everything is pricey here. This place increases your rent too soon after you lease their space, and continues increasing every year. I would not recommend this place, it's too expensive. The staff was very friendly. They answered all of my questions. I felt confident that my stuff was safe. Best rates in the area. I do wish they had a 6mo or 12 mo to lock in my rate but I'm still very happy with my choice in the facility. However, they are not always in the office according to the posted hours. I don't really understand the priced fluctuation. You can sign on for a certain price and then two or three months later, they can raise it. It bothers me that you cannot be locked into a price for a year. Other than that, it's a very clean facility with a good variety of space sizes. We've been a customer of this facility for 10 years. We have been very pleased with the management team and with the cleanliness and upkeep of the entire property. The overall experience was much better than ExtraSpace's competitors, like PublicStorage and others. The security is great, the particular location I rented from hasn't had an incident since they've been in operation, and offer many sizes of storage rooms available to give them a good advantage. They also offer AAA discounts and were overall a pleasant set of folks to work with! I moved into the facility a couple months ago because I just had way too much at my apartment. The facility is very cheap for the fact that it is located in such a nice location. Location makes a difference because I can even store stuff there that I use frequently. It isn't a problem to drive 3 or 4 minutes to pick up whatever I need. It is clean, cheap, and I have never had a problem. I would highly recommend renting space from this location. Looked around at price and this facility was the best for short term, not by much though. It took a while to get me set up, but after that I had no trouble getting in and out. Unit was clean and had a light which worked. The door into the unit wasn't the best and needed some force to get the latch to line up for the lock. Not many people in the lot when I was putting stuff in storage so that helped that nobody was in the way or needed me to move. Ceiling of the unit was over 10 feet which helped for stacking things high. There is a bit of a lip at the front of the unit which hopefully will help if it rains. 1700 Dela Cruz Santa Clara California is just one great strorage place. Great service, friendly staff, great location (close to Santa Clara University). The place office and compound is just immaculate. I feel it's a very secured area. From the moment they responded quickly to my email I was very impressed already. This is my second time renting already and I do spread the word to other parents that this storage place is highly recommended. The facility staff are very friendly and helpful. Units are clean and have lights in the locker. The only drawback is that they close the gate at 10pm and I would like to go there later. It was a little complicated for me to get there when I didn't know the area. After going several times and learning the area a bit more, I find it easy and convenient now. It's a good size of the storage with good price. I'll recommend to my friends. FROM HWY 101 S: Exit onto De La Cruz Blvd. You will see Mineta SJ airport on your left side. Continue down De La Cruz until you pass the light at Reed St. 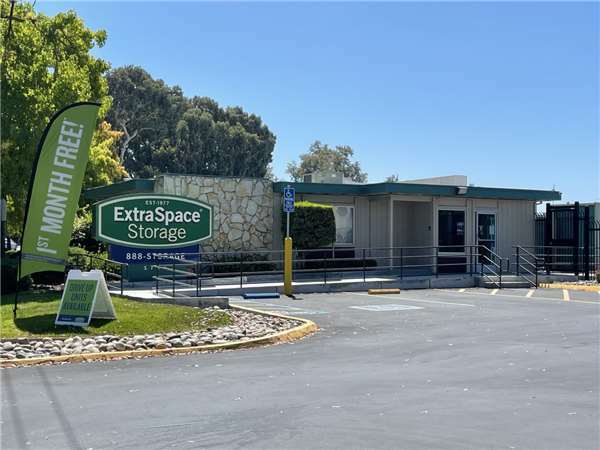 Extra Space Storage is located on the right side immediately after Liberty lighting, before you enter the fork back into San Jose/Santa Clara. FROM EL CAMINO REAL: Turn right onto Lafyette Street continue under the bridge until you come to Reed street . You will pass a dog park on your right. Continue on Reed street over the train tracks. Make a right hand turn onto De La Cruz Blvd. Extra Space Storage is located immediately on the right side, before you enter the fork back into San Jose/Santa Clara.